The Paul Scribner Robotics Lab is the newest addition to our school and its programs. Established in 2007 as a memorial to former student Paul Scribner, the lab is a physical manifestation of the Green Valley mission: to provide a hands-on educational experience for our students. The lab is a bright, generous, space where children can spread out to do their inventing. There are computer stations where children can test and program their robots. Equipment is available for every student. Each group works with one another to design, create, and program a robot to meet a designated challenge. A robotics class meets in the lab once each week to learn robot construction and programming principles. They learn to build robots using the latest Robotics Systems, as well as principles of motion and gearing, and use of light, touch, and ultrasonic sensors. 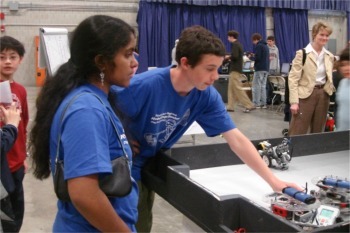 Each year, students compete in a variety of robot challenges that include mazes, obstacle courses, races, and soccer. Students have joined competitions at MIT, Carnegie-Mellon, and RoboCup Junior Competitions in Australia, Italy, Seattle and Montreal. With the addition of the Paul Scribner Robotics Lab, Green Valley School will be better able to continue its tradition of Robotics excellence.